Alice in Chains in September 2007. L-R: DuVall, Kinney, and Cantrell. The discography of Alice in Chains, a Seattle-based rock band, consists of six studio albums, three extended plays (EP), three live albums, five compilations, two DVDs, 35 music videos, and 32 singles (as of March 2019). Alice in Chains was formed in 1987 by guitarist Jerry Cantrell and drummer Sean Kinney, who then recruited bassist Mike Starr and singer Layne Staley. The band signed to Columbia Records in 1989 and released its first EP, We Die Young, in July 1990. Later that year, the band released its debut studio album, Facelift. The single "Man in the Box", which reached number 18 on the mainstream rock chart, helped Facelift achieve double Platinum status. The band toured in support of the album for two years before releasing the acoustic EP Sap in early 1992. In September 1992, Alice in Chains released Dirt. The critically acclaimed album, also the band's most successful, debuted at number six on the Billboard 200, and was certified quadruple Platinum. The band did not tour in support of Dirt for very long, due to Staley's drug addiction. While touring, Starr left the band due to personal reasons and was replaced by Mike Inez. 1994 saw the release of Alice in Chains' second acoustic EP, Jar of Flies. It entered the charts in the top slot, making it the first Alice in Chains release—and the first EP in history—to debut at number one. In 1995, the band released a self-titled album, which debuted at the top of the Billboard 200, and has since been awarded—along with Facelift—double Platinum status while Jar of Flies maintains Quadruple Platinum status. Alice in Chains entered a hiatus after not touring since the release of Dirt. From 1996 to 2002, the band was mostly inactive, releasing two live albums, including the successful Unplugged, and three compilations. On April 19, 2002, Staley was found dead in his home after overdosing on heroin and cocaine, causing the group to break up. In 2005, the band reunited with new vocalist William DuVall. On April 25, 2009, it was announced that Alice in Chains had signed to Virgin/EMI making it the band's first label change in their 20-plus year career. Black Gives Way to Blue, the group's first album with DuVall, was released on September 29, 2009. In 2011, Alice in Chains began work on their fifth studio album, The Devil Put Dinosaurs Here, which was released on May 28, 2013. Alice in Chains' sixth studio album, Rainier Fog, was released on August 24, 2018. As of 2018, Alice in Chains has had 18 Top 10 songs and five No. 1 hits on Billboard's Mainstream Rock chart. I ^ "No Excuses" did not chart on the Billboard Hot 100 but charted at number 48 on the Billboard Hot 100 Airplay chart, and number 32 on the Billboard Mainstream Top 40 chart. II ^ "Heaven Beside You" did not chart on the Billboard Hot 100 but charted at number 52 on the Billboard Hot 100 Airplay chart. III ^ "Get Born Again" did not chart on the Billboard Hot 100 but charted at number 6 on the Billboard Bubbling Under chart. IV ^ "Your Decision" did not chart on the Billboard Hot 100 but charted at number 9 on the Billboard Bubbling Under chart, and number 83 on the Billboard Hot 100 Airplay chart. V ^ Although the Hot Rock Songs Charts did not exist when "Would?" was released in 1992, it charted at number 15 in 2019 after the chart was created. 1992 "Would?" Singles soundtrack Later appeared on Dirt. 1993 "What the Hell Have I?" and "A Little Bitter" Last Action Hero soundtrack These songs later appeared on Music Bank. 1994 "Them Bones" Street Fighter II: The Animated Movie English soundtrack Originally appeared on Dirt. 1995 "Got Me Wrong" Clerks soundtrack Originally appeared on Sap. 1996 "Again" Marvin's Room soundtrack Originally appeared on Alice In Chains. 2004 "Them Bones" Riding Giants soundtrack and Grand Theft Auto: San Andreas Originally appeared on Dirt. 2008 "Would?" Burnout Paradise soundtrack Originally appeared on Dirt. 2009 "Rooster" Terminator Salvation soundtrack Originally appeared on Dirt. "Them Bones" Madden NFL 10 soundtrack Originally appeared on Dirt. 2000 "Bleed the Freak (live) "
A ^ Would? - Live 1992 is a reissue of Live at the Palladium, albeit from a different label and under a different name. ^ "Alice In Chains Official Music Videos (1989-2019)". YouTube. Retrieved March 25, 2019. ^ "Alice in Chains Videos - YouTube". YouTube. Retrieved November 1, 2018. ^ "Alice in Chains: Through the Looking Glass". Rolling Stone. 26 November 1992. Retrieved 16 July 2017. ^ "Interview Alice In Chains - Jerry Cantrell and Sean Kinney about Layne Staley". YouTube. 12 January 2010. Retrieved 16 July 2017. ^ Music Bank (Media notes). Alice in Chains. Columbia Records. 1996. 69580. ^ a b c d e f g h i j k l m n o "RIAA Searchable database – Gold and Platinum". Recording Industry Association of America. Retrieved November 25, 2017. ^ D'Angelo, Joe (April 20, 2002). "Layne Staley, Alice in Chains Singer, Dead At 34". VH1. Archived from the original on December 6, 2007. Retrieved November 25, 2007. ^ "2006 band bio - Aliceinchains.com". Aliceinchains.com. Archived from the original on July 19, 2006. Retrieved December 14, 2007. ^ Rothman, Robin (April 22, 2002). "Layne Staley Found Dead". Rolling Stone. Archived from the original on November 14, 2007. Retrieved November 24, 2007. ^ Wiederhorn, Jon (February 25, 2003). "Late Alice In Chains Singer Layne Staley's Last Interview Revealed In New Book". MTV. Archived from the original on December 17, 2007. Retrieved December 22, 2007. ^ Wood, Mikael (May 2009). "Get Born Again". Revolver. ^ "Alice In Chains Signs With Virgin/EMI". Blabbermouth.net. April 25, 2009. Archived from the original on 27 April 2009. Retrieved April 25, 2009. ^ "Alice In Chains: New Album Title, Release Date Revealed". Blabbermouth.net. June 11, 2009. Archived from the original on 14 June 2009. Retrieved June 11, 2009. ^ "Alice in Chains Follow-Up Album Likely, Says Frontman". Billboard. Prometheus Global Media. September 8, 2010. Archived from the original on September 8, 2010. Retrieved September 8, 2010. ^ "Alice in Chains Chart History - Mainstream Rock". Billboard. Retrieved October 30, 2018. ^ a b c d "Alice In Chains – Chart History: Billboard 200". Billboard. Retrieved September 5, 2018. Top 50 peaks: "Discography Alice in Chains". Hung Medien. Retrieved July 19, 2009. 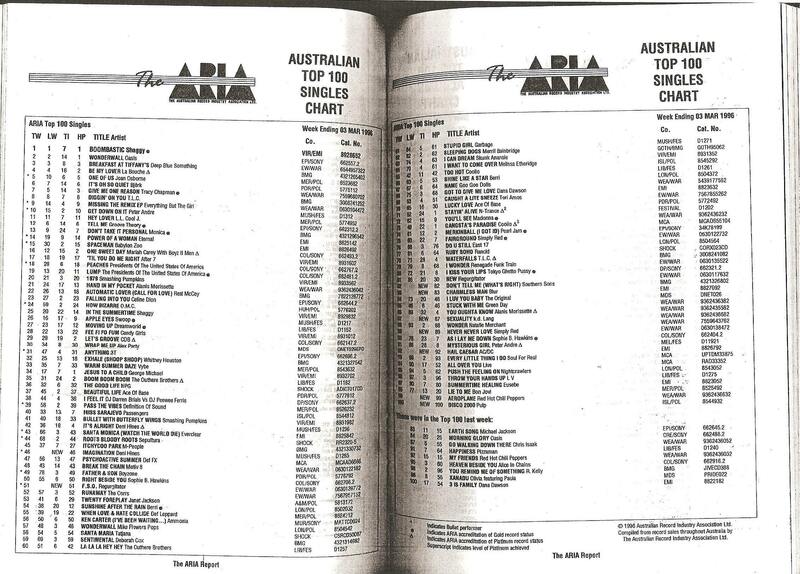 "Grind": "The ARIA Australian Top 100 Singles Chart – Week Ending 10 Dec 1995". Imgur.com (original document published by ARIA). Retrieved July 19, 2017. N.B. The HP column displays the highest peak reached. 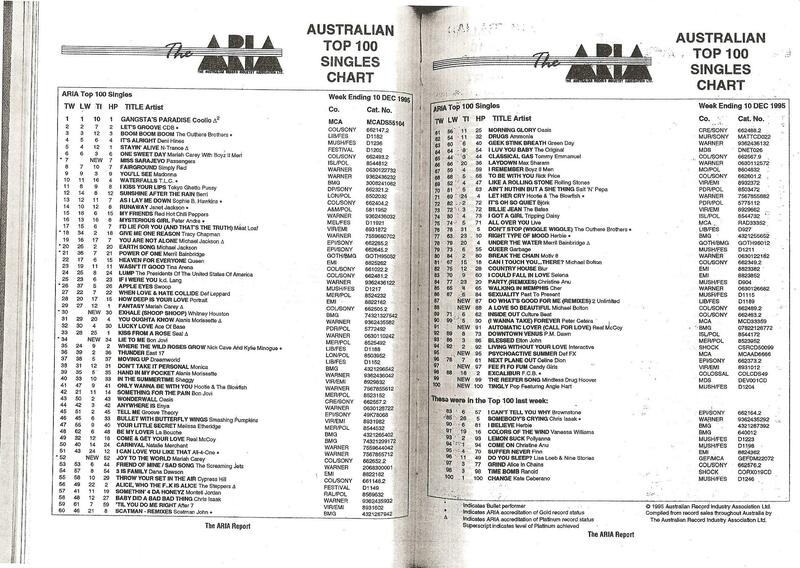 "Heaven Beside You": "The ARIA Australian Top 100 Singles Chart – Week Ending 03 Mar 1996". Imgur.com (original document published by ARIA). Retrieved July 31, 2017. ^ a b c "Alice in Chains Top Albums/CDs positions". RPM. Archived from the original on October 19, 2012. Retrieved October 12, 2010. ^ a b "Discography Alice in Chains" (in Finnish). Hung Medien. Retrieved February 14, 2008. ^ a b c "Chartverfolgung / Alice in Chains / Longplay". PhonoNet. Archived from the original on 2013-04-23. Retrieved July 19, 2009. ^ a b c d "Discografie Alice in Chains" (in Dutch). Hung Medien. Retrieved February 14, 2008. ^ a b c d "Discography Alice in Chains". Hung Medien. Retrieved February 14, 2008. ^ a b c "Discography Alice in Chains" (in Norwegian). Hung Medien. Retrieved February 14, 2008. ^ a b c "Discography Alice in Chains" (in Swedish). Hung Medien. Retrieved February 14, 2008. ^ a b c d e "ALICE IN CHAINS | full Official Chart history". Official Charts Company. Retrieved November 3, 2016. ^ a b "British Phonographic Industry statistics". British Phonographic Industry. Archived from the original on March 8, 2008. Retrieved April 6, 2008. ^ a b c d e "Gold Platinum Database: Alice In Chains". Canadian Recording Industry Association. Archived from the original on June 7, 2012. Retrieved September 1, 2011. ^ "ARIA Australian Top 50 Albums". Australian Recording Industry Association. September 3, 2018. Retrieved September 1, 2018. ^ "Billboard Canadian Albums". FYIMusicNews. Retrieved September 5, 2018. ^ "Sverigetopplistan – Sveriges Officiella Topplista". Sverigetopplistan. Retrieved August 31, 2018. Click on "Veckans albumlista". ^ a b "Discographie Alice in Chains" (in German). Hung Medien. Retrieved February 14, 2008. ^ "HITS OF THE WORLD". Billboard. Retrieved December 26, 2018. ^ "BLACK FRIDAY 2016 > Alice In Chains - Live---Facelift". Record Store Day. Retrieved December 17, 2017. ^ "Alice In Chains – Live Facelift". Discogs. Retrieved December 17, 2017. ^ "Alice In Chains – Jar Of Flies / SAP". Discogs. Retrieved 26 April 2018. ^ "Alice In Chains – Chart History: Hot 100". Billboard. Prometheus Global Media. Retrieved November 2, 2013. ^ "Alice In Chains – Chart History: Alternative Songs". Billboard. Prometheus Global Media. Archived from the original on June 22, 2010. Retrieved November 2, 2013. ^ "Alice In Chains – Chart History: Mainstream Rock Tracks". Billboard. Prometheus Global Media. Archived from the original on June 22, 2010. Retrieved November 2, 2013. ^ "Alice In Chains Chart History - Hot Rock Songs". Billboard. Retrieved 23 January 2019. ^ "Alice In Chains – Chart History: Rock Airplay". Billboard. Prometheus Global Media. Archived from the original on June 22, 2010. Retrieved November 2, 2013. ^ *For "No Excuses": "Top RPM Singles: Issue 2470". (RPM). Library and Archives Canada. Archived from the original on November 8, 2016. Retrieved November 7, 2016. For "Grind": "Top RPM Singles: Issue 2851". (RPM). Library and Archives Canada. Retrieved November 7, 2016. For "Over Now": "Top RPM Singles: Issue 9865". (RPM). Library and Archives Canada. Retrieved November 7, 2016. For: "Check My Brain" and "Your Decision": "Alice in Chains - Billboard Canadian Hot 100". (Billboard). Retrieved November 7, 2016. ^ "Irishcharts: searchable database". irishcharts.ie. Archived from the original on June 9, 2009. Retrieved July 18, 2009. ^ a b c Alice in Chains - Radio Songs (Hot 100 Airplay) chart history billboard.com. Retrieved November 3, 2016. ^ Alice in Chains - Mainstream Top 40 (Pop songs) chart history billboard.com. Retrieved December 8, 2016. ^ a b "Alice in Chains - Bubbling Under Charts". billboard.com. Retrieved November 3, 2016. ^ Alice in Chains. Soundtrack at the Internet Movie Database. Retrieved June 3, 2013. ^ "ALICE IN CHAINS Unveils 'Acid Bubble' Interactive Music Video". Blabbermouth. 17 September 2010. Retrieved 16 July 2017. ^ "Top Music Video – The Nona Tapes". Billboard charts. Archived from the original on January 14, 2009. Retrieved February 14, 2008. ^ "Top Music Video – Unplugged". Billboard charts. Archived from the original on January 14, 2009. Retrieved February 14, 2008. ^ "Top Music Video – Music Bank: The Videos". Billboard charts. Archived from the original on January 14, 2009. Retrieved February 14, 2008. ^ Grow, Kory (December 4, 2018). "Heart Live Album Features Alice in Chains, Dave Navarro". Rolling Stone.